Pit bull training tools are important accessories for training a pit bull. They can help the pit bull owner get their puppy in shape, help them socialize with humans and make them better pets. 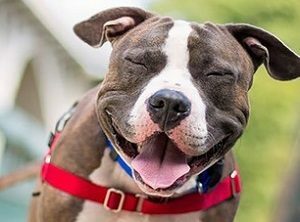 Responsible pit bull owners should spend time sending their pit pups through a “training camp” that will teach them obedience basics and to ensure that they are the best companions possible. 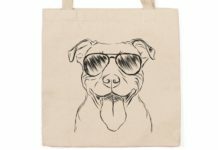 There are a variety of pit bull training aids which can include just about anything from chew bones, to tug-of-war ropes and even flirt toys. Choosing one or several of these aids can mean all the difference in the world as it pertains to training your pit. This flirt toy can be used with pit bulls or just about any dog of any size. It has an improved design over previous flirt toy models and is designed to hold up to heavy-duty use. It’s strong, yet lightweight and uses a bungee cord design to prevent the dog from getting whiplash. 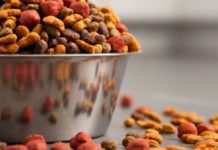 This model is also designed so that owners can quickly change out the lures without having to use the fasteners some models use which could scratch the dog’s mouth. This toy is a great way for owners to give their dogs some exercise or train their dog to do tricks. Whether you’re looking for a gift for another dog owner or simply want to purchase your pet a variety of different toys, then this 10-pack gift set might be the answer. 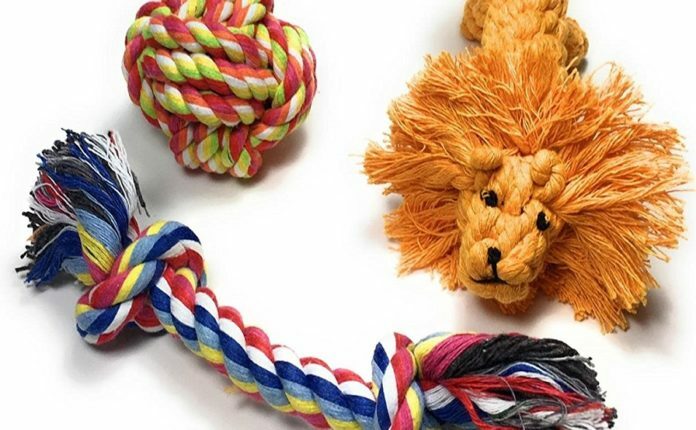 It has a variety of different dog toys for small to medium sized dogs and these toys have a variety of different functions. Some of the toys are rope toys, some are squeak toys and some are designed to be thrown. 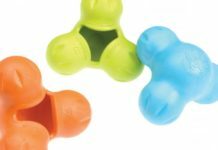 These pit bull toys come in vibrant colors and are designed to satisfy the dog’s instinctual needs such as chewing, pulling and playing. It also makes a nice dog toy starter set for new dog owners. This canine treadmill is a great way for your pit bull, or any dog up to 180-pounds, to get some exercise despite the weather. 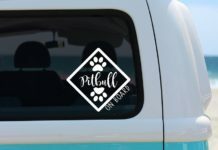 It’s designed with a 1.5 HP motor that is preset with customized fitness programs for your dog or you can set it to manual so your pit bull can run at his own pace. It has 71-inches by 16.5-inches of running space, but can be easily folded up for storage in smaller houses or apartments. Using this indoor dog treadmill will allow your dog to run every day no matter what. Rain, sleet, snow, excess heat or pollen will no longer keep your dog from getting the exercise they need. The Tumbo Tugger Outdoor Rope Toy is designed to be hung from a tree so that your pit bull can tug on it and play independently. When your dog bites down on its ends and pulls back, it shoots away from him or her using a bungee cord that then allows him/her to chase it again. This can provide hours of exercise and entertainment to your dog. This rope toy can be hung from any limb eight feet to thirteen feet high and since it’s attached to a limb, will always be easy to find. And since it’s designed to be durable, it should provide many hours of healthy fun. This dog tug toy is a great solution for the pit bull who wants to play tug of war all of the time. It’s designed to be fastened around a tree so that the dog can pull on the end of it in an endless tug o’ war. It can fit around trees up to 30-inches in diameter with a two-inch wide webbing strap that gives resistance without causing the damage to the tree bark that chains would cause. This toy also has a soft braided fleece tug toy on the end of it so that your dog doesn’t hurt his mouth or teeth on it. This heavy-duty spring pole is designed to be attached to a tree using an attachment rope (sold separately) to hold a tug rope (sold separately) to provide dogs which are over a hundred pounds in size the resistance they need for tug of war games. It can be hung from a tree or attached to a porch beam to be used as a ground tug of war game. 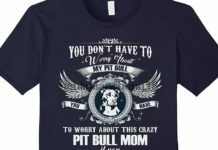 And since the spring and its links are made of high-quality metal, it should provide your pit bull hours of entertainment and exercise. Once it’s combined with a tug rope and an attachment rope, it will help your pit bull develop his or her conditioning strength—with your help and guidance, of course.